This is part 1/4 from our series on How To Setup A Site With October CMS. It is a wonderful tool but Installing October CMS can be difficult. This guide explains a quick and easy method. Maintaining a local environment sometimes feel like spinning plates. You get the site serving and build good stuff but the next day a white screen and log full of errors greets you when you open the laptop. Typically a developer will start with MAMP but that will go wrong so they move on to Vagrant. Things are fine until one day your regular gulp or grunt command no longer works and you realize that the promise Vagrant up was a lie and it's more difficult to preview your homepage than Vagrant suggests. Laravel enthusiasts will be more familiar with Homestead and it's pretty good but after yet another 2am hosts file change most will decide that enough is enough and just push the change to test live on the production server. Laravel Valet is a local environment for Mac developed by Laravel's creator, Taylor Otwell. It makes things incredibly simple. In short, It just works. So head on over to the Laravel docs for quick instructions on installing. So our machine is now setup to serve local sites quickly. We didn't have to add hosts file entries or mess around with nginx.conf. At this point we can proceed and install October CMS on Localhost by downloading it here. Unzip the package and copy the install-master folder into your local machine site root where you ran the valet park command. In our case export/www. October will then run the preinstall checks to see if your system meets all the requirements. Scroll to the bottom and click Agree & Continue. After this we come to the database panel where we can configure the connections. Copy what you see in the screenshot below replacing leaderapps with your DB name, then click the Administrator > button. Before we finalise the installation we need a database for the code to communicate with so go ahead and set one up on your local machine. We will do this in Sequel Pro but feel free to use any program you want. Once in Sequel Pro, create a new server connection named valet. All of the databases you create on your localhost will be accessible by connecting to valet from this point onwards. Click connect and the connection will open. Now we need to create the actual database. 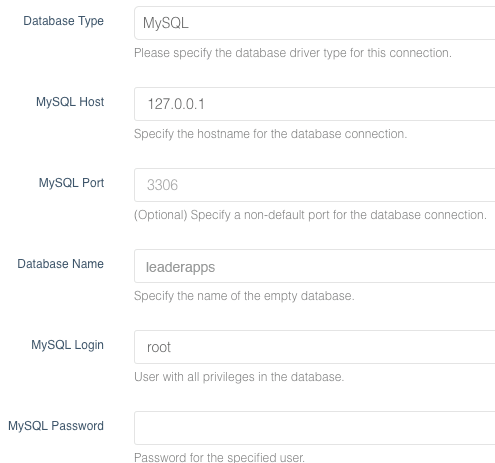 We're going to call it leaderapps, exactly as you saw in the database panel when setting up october. Watch the progress bar load for about a minute and then you will see your beautiful new backend! It's very important to do what October tells us and delete the installation files at this point. Go to your site root and delete install.php and install_files. Now you can go to your site in the browser and you will see the homepage. Before we commit everything we need to tidy up the repository so it's in the best state for ongoing development. Our configuration values are hardcoded in the app/config/ files. While this is fine for development, it will cause problems when we want to deploy to production and use different values. October gives you an easy way to extract these configs out into a .env file. This creates a .env file in the project root with all the configs copied into it. .env files are environment specific so the settings for your local will not work on production. This shouldn’t be committed because it exposes your database username and password so if your project is on GitHub and happens to be made public, the details to access your system will be exposed to attackers. Opinion varies wildly on this topic but after building lots of sites we’ve found that committing the vendor folder works for us. This will bloat the size of your repo as all the packages will be stored on your local but it’s a matter of preference. We choose to run composer update locally and store vendor files in the repo because running it on the production server can be catastrophic if the command doesn’t complete or downloads a breaking change. When you store the vendor files in your repo and run composer update from your local machine you can catch any breaking updates before they make it onto production. Ignoring the Storage folder is advised but we haven’t found any problems from not ignoring it. Once you've added the .env file to your gitignore you should commit everything. In this article we setup Valet and Intalled October CMS locally in a matter of minutes. Not only do we have a local site to develop with, we also have a very easy way to quickly set up local domains that are not even October CMS. Just put them in export/www and hit the folder name in the browser followed by .dev. Remember all those times you saw a good tutorial or a nice code snippet but it was taking forever to set up a local domain? Well now you can simply download the tutorial code and paste the folder into export/www. Valet alone will speed up your development time exponentially. When you couple that with the power of October CMS, you have a formidable and reliable local environment from which to build the next big thing. In part two of our series on How To Build A Site With OcteberCMS, we will show you how to deploy October to production for the first time. This saved me a huge amount of time setting up October CMS on my local. I hadn't heard of Valet until now. Thanks for putting this together.